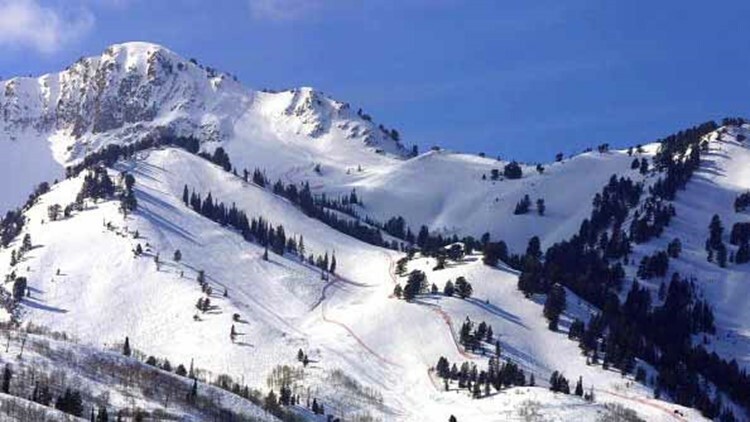 This photo shows Snowbasin Ski Resort, Snowbasin, Utah, the site of the down hill skiing for the Salt Lake City 2002 Winter Olympics, 18 February 2001. The IOC is struggling to find cities willing to take on the financial and societal burden of hosting the Winter Olympics, a far cry from the fierce competition between cities that was commonplace last time the city made a bid. SALT LAKE CITY (AP) — When Salt Lake City pursued the Winter Olympics more than two decades ago, competition was so fierce that lavishing International Olympic Committee members with gifts and favors seemed commonplace. Salt Lake City got caught in a bribery scandal that nearly derailed the plans for the 2002 Winter Olympics. That's why a city that, for a time, stood out as a pariah in the Olympic world is a serious contender again, this time for the 2030 Winter Games — decades sooner than anyone expected and despite that bid scandal. Utah's capital city is among an increasingly small group of cities worldwide that has the venues needed for winter sports and the willingness to take on the costly task of hosting Olympics that have lost some of their cache. The U.S. Olympic Committee last week chose Salt Lake City over Denver as a future bid city. The IOC will choose a 2030 host by 2023 at the latest. Jules Boykoff, a Pacific University professor who has written widely on the Olympics, said the bribery scandal is "a pretty big stain on the history of the games." "But these days, the International Olympic Committee is not in a position to be overly picky," Boykoff said. The scandal broke in 1998, three years after Salt Lake City was chosen over cities in Canada, Sweden and Switzerland. Salt Lake's bid committee doled out $1 million in cash, scholarships, medical care, gifts and other favors to IOC members and their families. That included ski trips, NBA tickets, plastic surgery, knee replacements, violins and housing and salary for children of IOC members, according to report by an ethics panel. Olympic historian David Wallechinsky said Salt Lake City's current bid officials will have to talk about the scandal, but he doesn't think it will impact their candidacy. The Salt Lake City bribery scandal capped off decades of cities trying to win the favor of IOC board members behind the scenes. "They learned from the corruption of other cities that beat them before," Wallechinsky said. "It's not like they invented the corruption . . . they just got caught." "That's good for Salt lake City," said Romney, elected last month to represent Utah in the U.S. Senate. "We will be judged on the merits." Before the IOC picks a city for 2030, it will have to choose a host for 2026 between Stockholm and the duel bid of Milan and Cortina d' Ampezzo, Italy. Calgary, Canada, host of the 1998 Winter Olympics, backed out after voters rejected a referendum. Three other cities withdrew earlier this year and Erzurum, Turkey, was eliminated last month by the IOC. Salt Lake City says it can host the Olympics for about $1.35 billion, not including additional security costs covered by the U.S. government, relying mainly on existing venues. Stockholm and Milan/Cortina d' Ampezzo offer similar plans and similarly low estimates, $1.5 billion. Salt Lake City's 2002 Olympics cost $2.52 billion, a 24 percent cost overrun, the Oxford report found. That was actually the second lowest cost overrun behind only the 2010 Vancouver Olympics among all Olympics held from 1960-2016. "Right now, everything is kind of like unicorns and rainbows and low budgets," Boykoff. "Almost inevitably the price tag tends to go up."